The killing of tourist Cindy Waldron by a saltwater crocodile while swimming north of Cairns on Sunday has reignited the debate about how to keep people safe from crocs. Federal MP Bob Katter has called for a bigger crocodile cull, although the Queensland government has once again ruled this out. There are very good reasons for this decision. The evidence suggests that calls for complete deregulation of croc hunting are based on flawed arguments. The easiest way to keep people safe is to make sure they understand the risks. What have we been doing about crocodiles? Crocodile populations have been managed in northern Australia since the early 1970s. Before that, it was open season: three decades of hunting wiped out 95% of wild crocodiles, although getting them all proved impossible. Many hunters grew to respect these unequivocally Australian “beasts”, supporting their subsequent protection. Yet their numbers bounced back much faster than anyone expected. Questions were soon being asked about the wisdom of allowing their recovery. 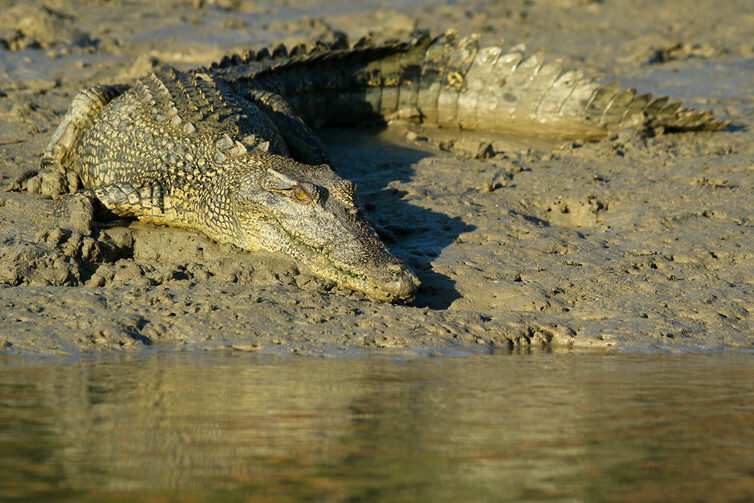 Sub-adult saltwater crocodile basking on a tidal mud bank, a popular sight for the many tourists who visit northern Australia each year. Recognising the value of crocodiles to people and ecosystem health, the Northern Territory government changed tack. Crocs became tourism icons, their eggs and skins were harvested sustainably to create local jobs and a fledgling industry, and safety issues were managed by the targeted removal of “problem” crocodiles, alongside visible media campaigns about staying safe. Despite differences between states and territory, the same basic approach is still used. Has it been effective in saving lives? The first subsequent recorded fatal attack in Queensland happened in 1975, when Peter Reimers was killed while wading in a creek near Mission River. This was only a year after the crocodile population had been protected because it was on the verge of disappearing. Three decades of unregulated hunting hadn’t saved Reimers’ life. The latest statistics as compiled by CrocBITE show 112 attacks between 1971 and May 2016, 33 (30%) of them fatal. That’s an average of 2.5 non-fatal attacks per year and 0.7 fatal attacks per year across Western Australia, the Northern Territory and Queensland. 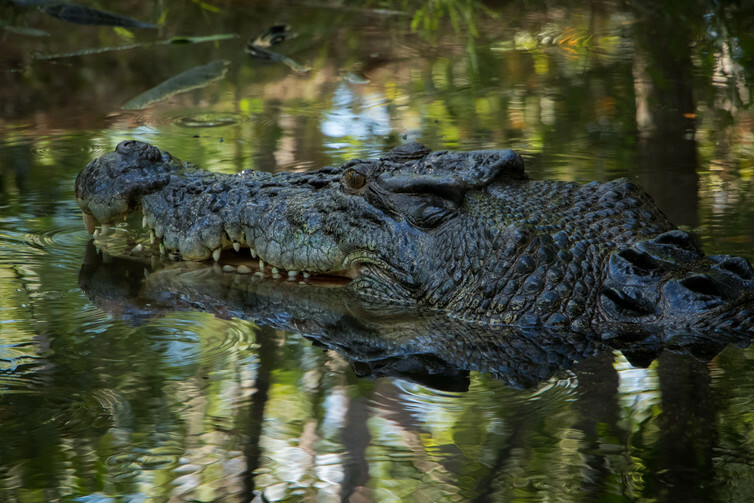 The rate has increased slightly over the past decade, but crocodile attacks remain extremely rare in Australia. Number of reported saltwater crocodile attacks per country (April 2007 to April 2014). Fatal proportion in red, percentage shows fatality rate. The average size of crocodiles is increasing as the population continues to mature towards full recovery. However, given the very low number of attacks, it’s difficult to assess if this has had any impact on the fatality rate. Attacks usually happen because people get in the water with crocodiles. Such an obvious cause should be easy to prevent, and indeed this is the case. Attack risk in Australia is low, largely because of the success of long-running campaigns to warn people of the dangers of swimming in crocodile-populated waters. What lurks beneath? 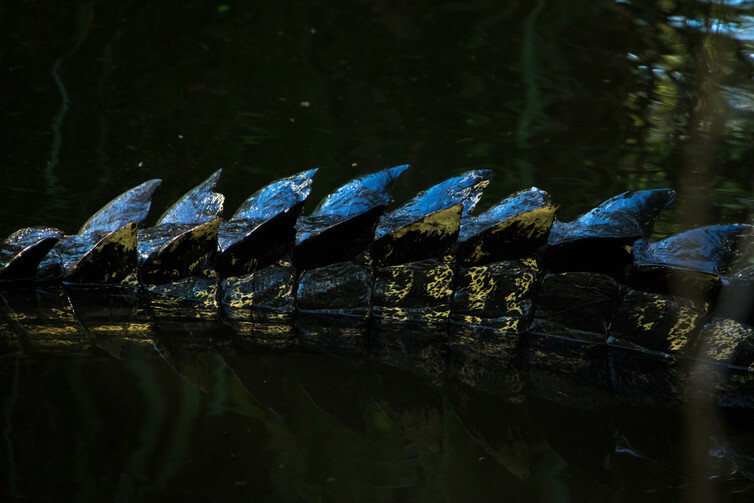 If you’re in crocodile habitat and you find water, always assume that it harbours a crocodile. Those who live locally are generally most keenly aware of the dangers. Sadly, a disproportionate number of attack victims are visitors who aren’t as aware of the risks. The real problem can therefore be interpreted as a failure to communicate risk, and therein lies the solution. Crocodile attacks are traumatic, unfortunate and potentially tragic incidents that generally can be avoided. Australia has an excellent track record in saving people from crocodile attack. Despite having more saltwater crocodiles than any other country, we have low fatality rates because our management and education program is world-class. Other countries with crocodiles come to Australia for advice on how to manage their crocodile populations and prevent conflict with people. But there’s still a grey area for many people. How do you know whether it’s safe to swim in northern Australia? What’s the risk of doing so? We make decisions every day to assess risk, whether we’re driving, walking down the street, swimming in a pool, or taking a boat out on the water. We’ve been trained to minimise the risks we face. The same is true of going into the bush and facing potential dangers from snakes, mosquitoes or other animals. Sometimes accidents will happen, often because someone decided to push their luck. Distribution of saltwater crocodiles throughout their range, including northern Australia. Green are viable populations, orange are recently extirpated populations and blue represents their potential for movement within and between countries. But with crocodiles the rules are simple: don’t enter the water in crocodile habitat. In these areas, stay away from the water’s edge, don’t disturb water consistently in the same place, don’t approach or tease crocodiles, camp at least 50 metres from the bank, and don’t go out in small, unstable boats. Warning signs about crocodiles are there for a reason, to allow you to make an informed decision about your personal safety. Ignore them and you may get away with it, but eventually you will not. The name ‘saltwater crocodile’ is misleading. They are equally at home in freshwater habitats. There’s little doubt that Australia knows how to manage wild crocodile populations. The risk of being attacked by a crocodile here is vanishingly small because crocs and people are managed effectively. We already have a limited cull of crocodiles; the targeting and removal of specific animals that, through their actions, pose an elevated risk to the public. A wider cull won’t gain anything, at the cost of local livelihoods and our natural resources. This article was co-authored by Erin Britton, a biologist at Big Gecko Crocodilian Research in Darwin.